I’m still totally obsessed with my holiday to Lisbon last month. Even more so right now – I’ve managed to break my foot! The memory of being so footloose and fancy-free only 30 days ago is keeping me going through the drama of wearing the uncomfortable walking boot and using crutches awkwardly! My first blog post about my amazing visit to Portugal in June covered some of the top sites to see and things to do. This post is going to look at the most important part of my trip, without a doubt – what I ate and what I drank! Our go-to breakfast spot was located a few minutes down the road from our Airbnb. It’s conveniently just opposite the Santa Apologia train station that was our nearest metro stop. 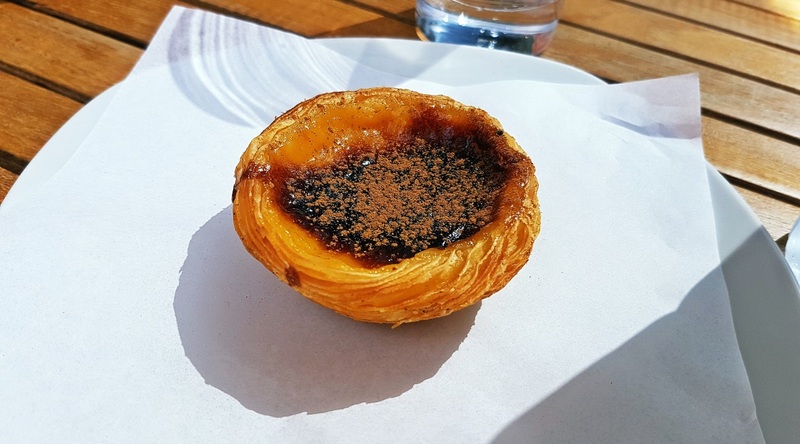 It was the first place we got to try my new favourite pastry – Pastel de Nata, a custard tart that is one of Portugal’s most famous exports. Served slightly warm, they are absolutely stunning with a sprinkle of cinnamon over the top. It also served a range of cold drinks, sandwiches, toasties and more. We stopped in for breakfast every morning (except Sunday, when it was closed). Our first meal out was a late lunch after exploring the Castle. Only a stone’s throw from the castle gates, it came highly recommended on Foursquare. Our water brought out a selection of small starters including crusty bread, a carrot salad, and the best olives I’ve ever eaten. We drank some cooling rose while waiting for our mains. I decided to try Portugal’s national dish, bacalhau, or dried and salted cod. Yes, despite being literally on the banks of a giant river, their national dish is a fish that’s caught in Greenland and heavily preserved. But it was pretty damn tasty, as were Keeleigh and Sarah’s meals. Unfortunately we didn’t technically eat here – we misunderstood what they meant by market! Our plan had been to pick up some different foods and take them back to the flat for dinner. But once we arrived, we realised it was more of a food hall than a traditional market. Having just eaten lunch, the other girls bought cocktails from one of the many different spirit stands. Meanwhile I shockingly passed on cocktails and went for an iced coffee. We did buy some tasty olives (a LOT of olives, they were so cheap) and some strong goats cheese to add to our meal that night. Our last night meal out was in the Bairro Alto area. On a whim we decided to get the metro to Restauradores… Surely somewhere with a name like must have good restaurants? This could have gone very badly, considering the root of the Metro name was actually the Restoration Monument… But we were in luck. After perusing a few menus we decided on an unassuming little restaurant that promised fresh fish. Again, they brought out a variety of starters: some super tasty cheese, some codfish cakes that we’d seen sold in a few different places, and the obligatory bread and olives (although these olives were sadly the least good of the trip). For my main I went for a whole golden bream. It was simple – just grilled and served with potatoes and salad. But the quality of the seafood shone out despite the plainness of the dish. Combined with the starters, and a large jug of white sangria, plus a cheeky glass of Portugal’s own port after, it was a fantastic last meal for the trip. We actually ate in on two of the evenings. For both we stocked up at our local supermarket, with a few additions from the Time Out Market on the second night. European basics are just so damn good! With some fresh bread, cheese, salad, cured meats and a bottle of wine, a meal in can feel even more exotic than a fancy dinner out. I spotted this place on Foursquare and was immediately drawn by the idea of trying another signature Lisbon delicacy. Ginjinha, or ginha, is a liqueur made from sour cherries, aguardiente and sugar. The drink actually originated from this tiny hole-in-the-wall establishment, and at only EUR1.20 it’s a pretty cheap shot. You have the choice of whether you want a cherry or not, and we all chose to try with cherry… But to be honest they were more strongly alcoholic than the drink itself and not really to our taste. But the liqueur itself was so nice that I ordered a few more shots of it at bars throughout the trip. Plus I brought two bottles back as souvenirs. Towards the end of our first day in Lisbon, we were contemplating the twenty minute walk back to our flat… But were in dire need of a refreshment break first! This was how we ended up in one of those tourist trap bars that you find on any popular city square. Can the Can was certainly among the more expensive places we stopped, but there was one thing that definitely made it worth it. When we walked over, the waitress asked “shower or no shower?”. Despite everyone’s English having been pretty spot on so far, we assumed it was a communication error, and she meant shadow or shade. Until we noticed… there was water coming out of the umbrellas! The fine mist didn’t get us damp, just chilled us down a little bit. We were cooled further by the pitcher of champagne sangria with red fruits! Perfect to get us back on track for the rest of the day! On our Big Night Out (capital letters compulsory), we knew what area to head to. We’d heard through the grapevine that Bairro Alto was the place to go. My guidebook was full of suggestions of bars to try… But we forgot most of the place names and just got swept up in the vibe of the place. Our first stop was Portas Largas (which, as we discovered later, was actually mentioned in my guide book!). Drinks were served Medium, Large or XL, and comprised all the classic summer drinks – pina coladas, mojitos, pints of Super Bock beer – and all cheaply priced. It was one of the larger bars in the area, though half the floor was taken up with a live band playing what we thought might be Fado music. It was buzzy and noisy and a great first stop. Our second bar of the evening was Clube da Esquina, or the Corner Club. It’s just five minutes walk from Portas Largas, and a much quieter affair. We decided to go for some Vinho Verde (Portugal’s famous slightly fizzy “green” wine). It was a a lot quieter, and although the drinks were good (and still cheap) and the music ambience was alright, we were dying for something a bit more adventurous. This place checked the adventurous box! PARK was very busy, as you might expect. It was definitely more expensive than the little hole-in-the-wall bars we’d been to earlier in the night. But sat out on the edge of the car park, gazing across the city towards the river, with a glass of Mojito de Morango in hand… It was heaven. After a little while we decided to dance. While Desparcito made an appearance, it was mostly Portuguese music. We were dying for something British, so when the place closed at 2am we headed on into the night. Okay, I’ll be honest… I don’t know what this place was called. It was something like Bar Portuguese, which is far too generic for Google to be able to help me. But we somehow stumbled our way back to the main streets of Bairro Alto and into a bar that served us not only wine, but a steady stream of music requests from the friendly DJ in the corner. The staff were chatty, offered us a shot of… well, something with tequila and cinnamon… and put up with our ridiculous dancing until we finally managed to make our way to a taxi. It was fantastic! Our last night in Lisbon found us again in Bairro Alto. The first place we went was so horrendously bad I’ve blocked it from my memory, but the second place more than made up for it. Spot Bairro Alto was probably the smallest place we went, but we heard an acoustic version of Desparcito playing out into the night… We followed it like moths to a flame. The live music was amazing. The bartender was friendly (and again, gave a weird tequila and cinnamon shot), and we even met minor film star who taught us how to Samba and amused us with contradictory stories of his life. It was such an incredible end to the holiday. Have you been to Lisbon? Got any recommendations for other places to eat and drink at?